Your engineering or scientific curriculum taught you the technical aspects of your career. But where are you to learn the non-technical skills that are necessary for a long and successful technical or management career once you are inside an organization? My new book is all about providing you with those necessary skills, the ones you did not learn in college. Joseph Riggio, Ph.D. Founder and President of Applied Behavioral Technologies, Inc.
Buy Steven's book at a 40% discount. 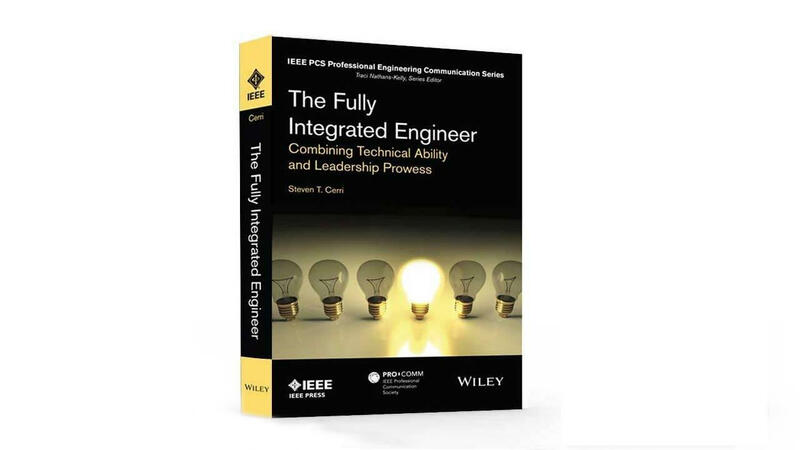 Sign up for Steven's FREE monthly newsletter and receive 40% off the Fully Integrated Engineer list price! Millenials! Use Steven's new book to advance your technical career! Here is an example of how to use the information in Steven's new book to advance your career. Click to see how. What Is In Steven's New Book? College teaches you to be a good engineer. But it's likely that your college engineering courses didn't have time to teach you how to effectively contribute your ideas or how to transition to management or leadership. The information, processes, and tools you will find in my new book are designed to provide you with those missing tools. The information in my book address the differences between being proficient as a technical individual contributor and effectively contributing to and leading teams and doing so on various projects. Being a "Fully Integrated Engineer" is about learning that the habits and skills you learned in school, while contributing to your individual short-term success, actually become hindrances in the modern engineering workplace. My book will show you how to address those limiting habits, turning you into an effective team contributor and leader building toward long-term career success. * Identify patterns of behavior that don't serve you (or your organization) well and change them. * Create a plan of action that will allow for personal change that will impact your professional work. * Promote the talents and skills of the team players around you. * Become a flexible, supportive, and positive asset. This book is intended for all engineers, scientists, and technologists who work on both group and individual projects and who are or who want to become leaders and managers in their companies. It is also great for engineering students who want to get a head start on their careers. For more information about Steven's new book, and to read sample chapters, click on the links at the top of this page. Also, if you would like Steven to speak at your organization's event or meeting or conduct a mini-class on the material in his new book please contact us at: [email protected]. This book is a "Gem of Wisdom"
This is a biased review in that I have taken several of Steven Cerri's workshops and knew exactly what to expect. However, I did purchase this book (full price) and it was not a requirement for any of the workshops. One of the issues facing technical professionals today - one that unfortunately is not taught in college - is how the skills that made them successful in college (and as an early technical employee) are not the skills required for a successful long-term career. This book outlines what Steven Cerri calls the 15 Career Limiting Beliefs and the corresponding 15 Gems of Wisdom needed to re-frame those beliefs in ways to ensure a successful long-term career. Of course, the advice is sound, but where this book really shines is in it's relatable examples.....anyone who has spent any amount of time as a professional will instantly recognize some, if not most, of these behaviors (in others and no doubt in themselves!) Recent college grads and seasoned professionals alike should consider reading Cerr's book if only to better understand what it takes to be more than simply a "good" individual contributor.